The holidays have come and gone. If you already have a system for storing your decorations, keep doing what you’re doing. However, if you have recently moved into a new home or are looking for a new way of organizing, this article is for you! DO NOT store a fake tree in its original box. The cardboard will deteriorate over time. DO store your tree in a commercial “tree bag” if it is a whole tree or inside several black garbage bags if it comes in two or three parts. If you do not have room inside a hall/basement closet, the garage is a great place to store a holiday tree, especially if it’s six feet tall. Small ornaments fit well inside empty egg cartons, so save those convenient containers throughout the fall months. Although it may be tough to keep track of the original boxes belonging to older ornaments, try to keep the box in which each ornament is packed. It is a lot easier to store boxes rather than oddly shaped ornaments. If you cannot find an original box, plastic cups and shredded newspaper work just as well. To prevent scratching, wrap candles in newspaper or tuck them inside old socks. DO NOT store candles in a very warm places, as the wax will melt. Even the slightest bit warmth may leave with you a misshapen candle. When it comes to potpourri, there is no way around storing little bits and pieces other than to dump them in a plastic container. Make sure the lid is secure; duct tape it if you have to. Treat figurines the same way you would ornaments. If an original box is unavailable, try newspaper. If you have holiday towels or linens, easily store them by wrapping them around your figurines (or even by laying them in between layers of ornaments). The best place to store figurines would be on a shelf inside a closet. If you have to put a box on the floor, keep it towards the top to avoid breakage. Cut a large piece of cardboard, perhaps the side of a box, into a rectangular shape. Then make small slits on each side and keep them an inch or two apart. Wrap the lights around the board, tucking the cord in each slit as you move down. Carefully wrap the strand in a circular motion and place the strand into a plastic bag. 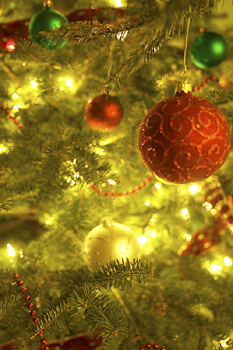 If you toss the lights in unprotected, they may tangle or even break. The garage may not be the best place to store lights if you live in a cold climate. You may find that a lot of the works don’t work after sitting “outside” in the cold. How do you store your holiday decorations? Share your ideas below!